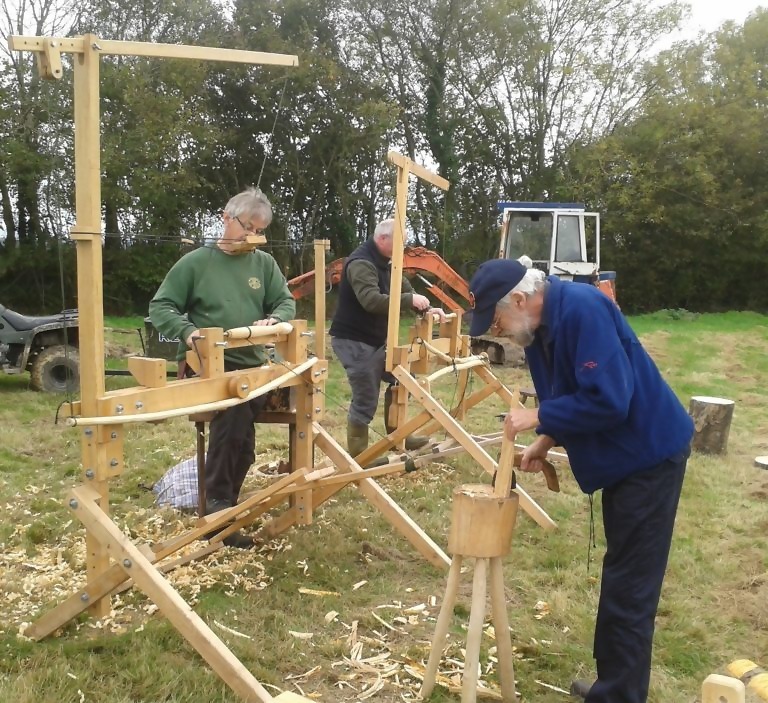 Demonstrations of pole-lathe turning and allied crafts for the advancement of the aims of the Association of Pole-lathe Turners and Greenwood Workers to promote green woodworking and all its associated crafts so that once again the woodlands of the world are nurtured and valued as a source of employment and enjoyment..
BodgerJohn is one of over 950 members of the Association of Pole-lathe Turners and Greenwood Workers in the UK and overseas who continue to keep historic greenwood craftworking alive; by practicing and demonstrating pole-lathe turning and other rustic skills, running workshops, and introducing others to the pleasure and satisfaction to be derived from working with greenwood. 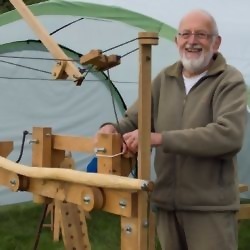 BodgerJohn may be seen demonstrating pole-lathe turning and running workshops at a number of festivals, gatherings and craft fairs throughout the year. 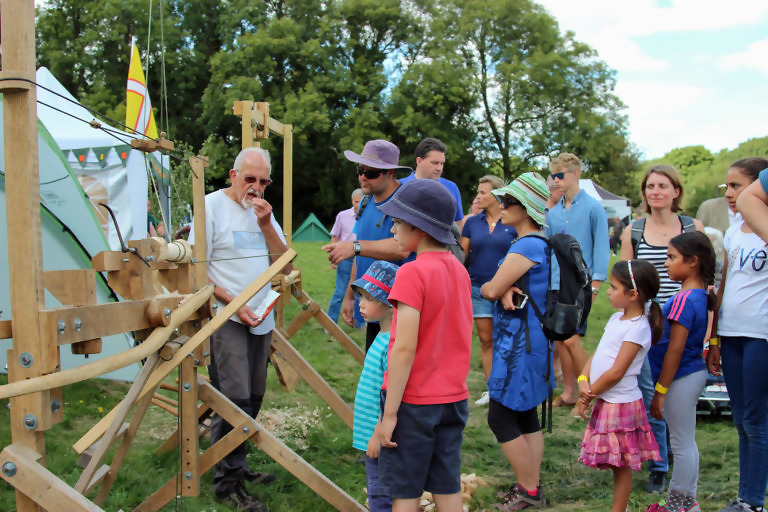 Like most greenwood workers, he is always happy to share his knowledge and experience with anyone interested; and if they want to ‘have a go’, then so much the better. 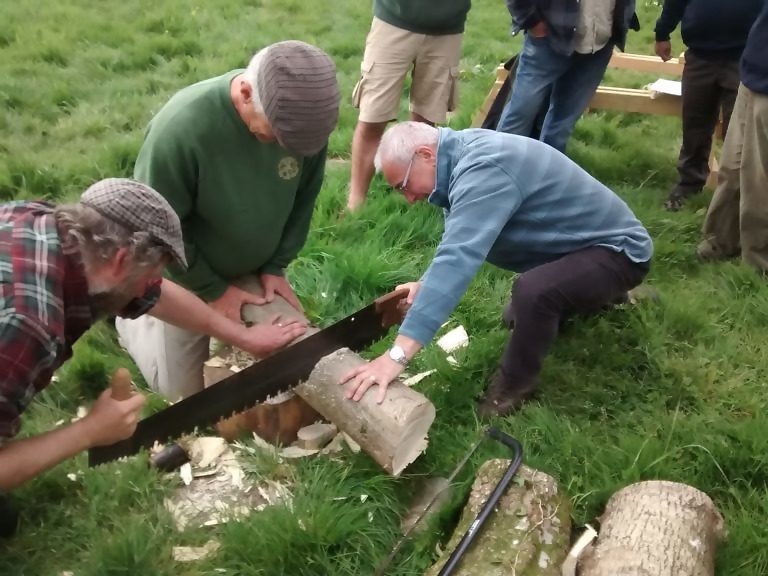 For anyone interested in learning to turn wood on a pole-lathe and is local to Poole, in the area on holiday, or just fancies a short break from the rat-race, training can be provided at Redbridge Farm on a one-to-one basis or as part of a small group. 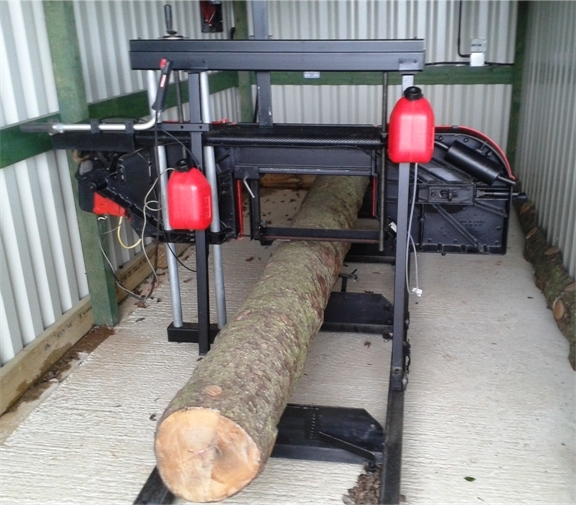 If you already have some experience in pole-lathe turning and would like to do some more, but do not have your own equipment, you are welcome to come along and use the greenwood working facilities at Redbridge Farm (subject to notice and availability). Please visit website ( http://bodgerjohn.com ) for more details. 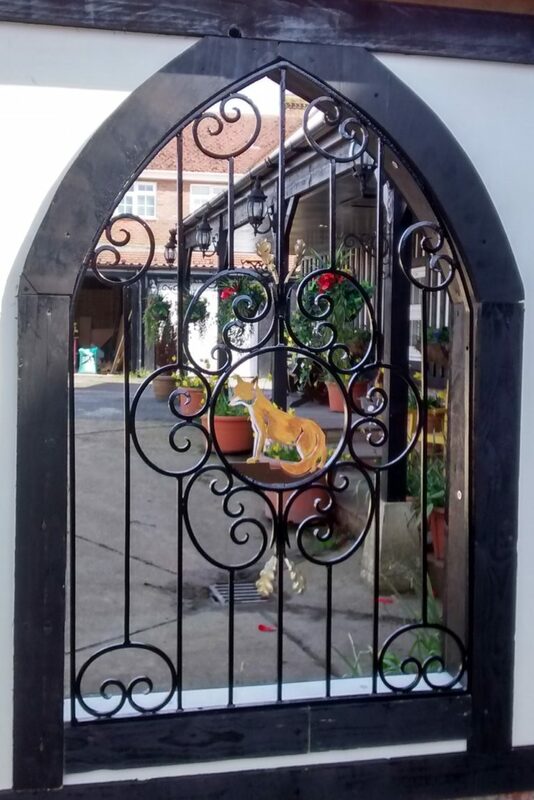 A wrought iron ‘window’ inset into wall. This item was rusted, bent and with broken welds when received. It has now been repaired and repainted and positioned in the wooden framework ready for fixing. Dorset and Hampshire APT groups’ Spring 2017 meeting at Redbridge Farm. Completely rebuilt and operable after suffering years of neglect. 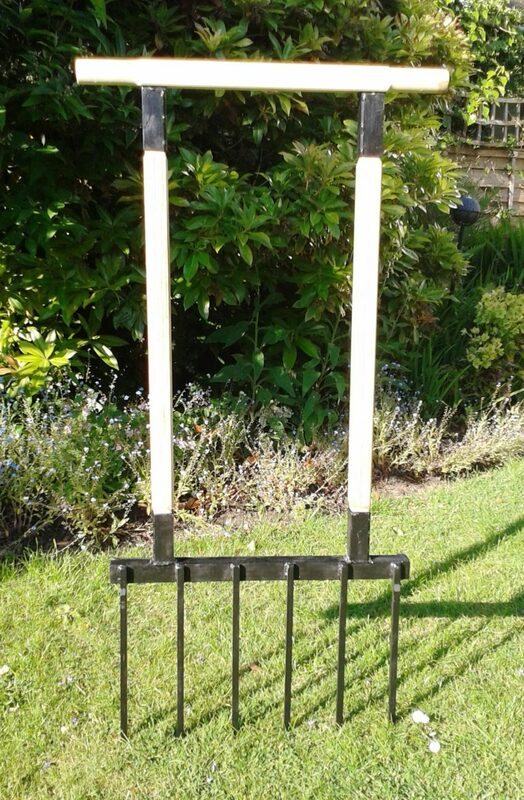 A broadfork made for a community green space. A broadfork is a multi-tined fork used to aerate and break up topsoil in long furrows, acting like a primitive plough, but causing far less damage and negative impact on the soil. Although a common implement in some parts of the world, e.g. Australia, they are not readily available in this country. This means they either have to be imported or manufactured locally. 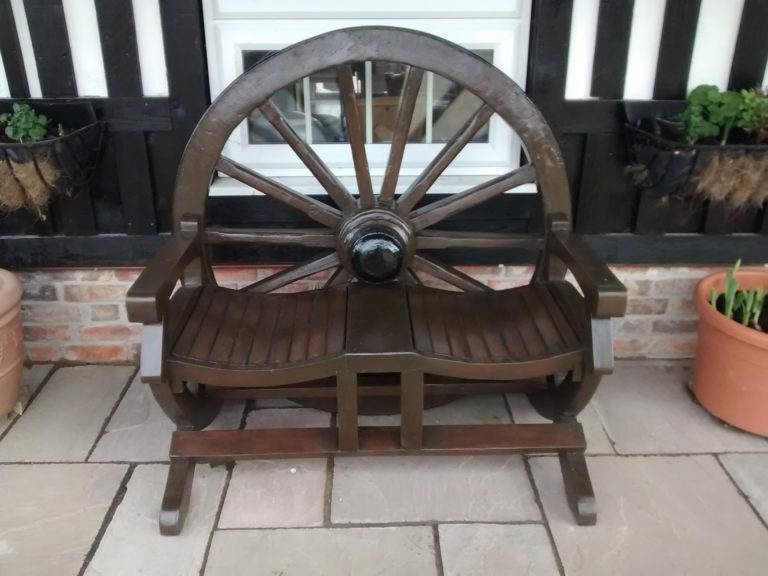 Cartwheel seat – completely rebuilt. The original seat had rotted beyond repair and only the wheel itself was salvageable. 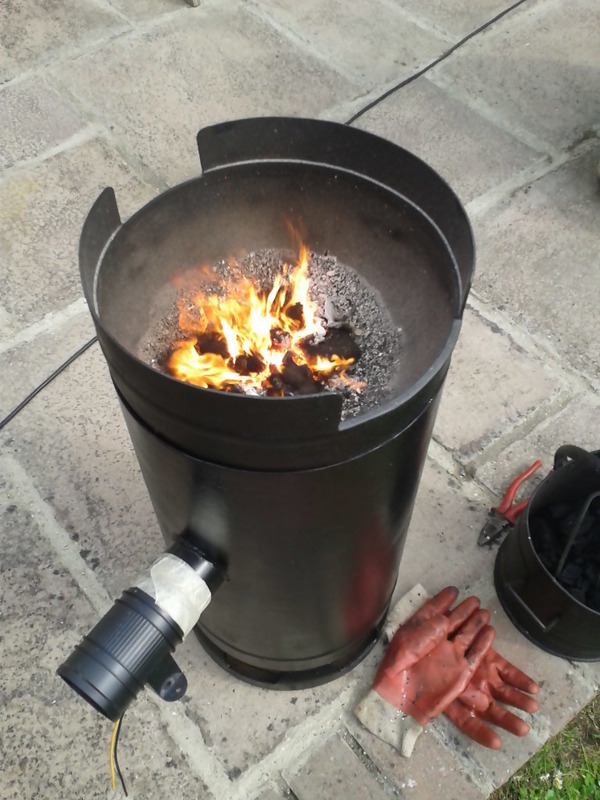 A portable charcoal metalworking forge, made by BodgerJohn from a recycled propane cylinder. Air is blown through the forge by a bilge blower powered by a 12v car battery. 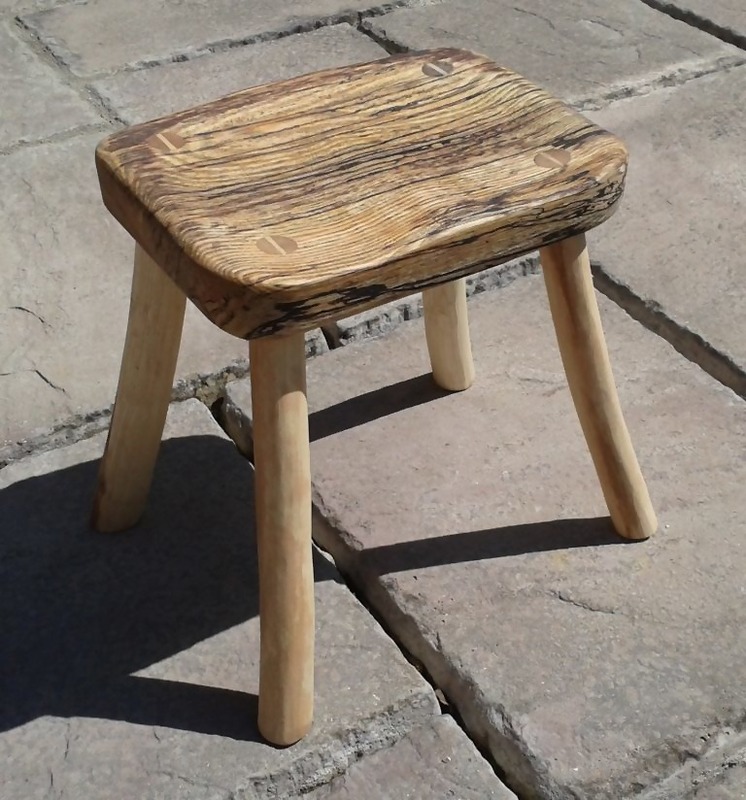 A rustic stool made from spalted Ash by BodgerJohn. 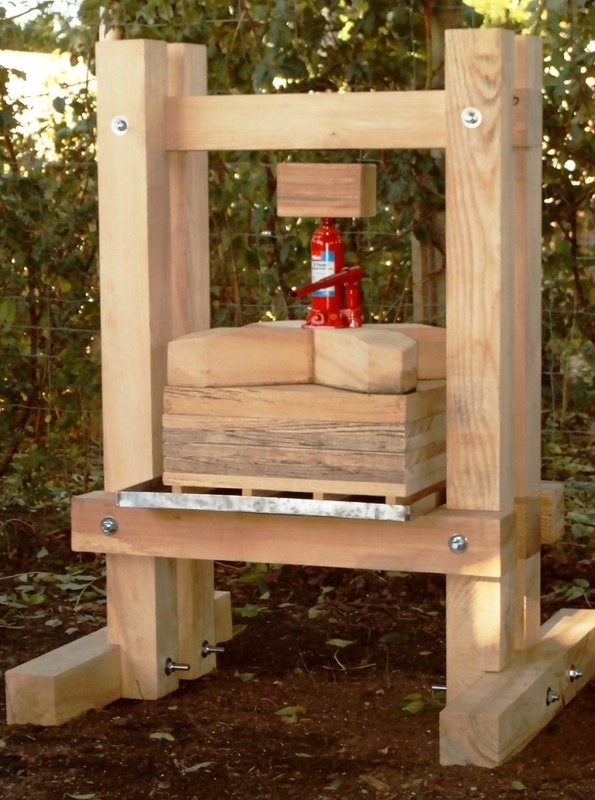 An apple press built for a charitable association. Apples are first crushed using a tool called a ‘scratter’, before being wrapped in a set of muslin cloths. These packages are called ‘cheeses‘. The cheeses are then placed between a stack of press plates and a hydraulic car jack is used to apply pressure to squeeze out the juice into a stainless steel tray. From here it pours into a suitable container. Ideally, the pressure would be applied via a large wooden screw and nut. However, manufacture of this arrangement would have exceeded the available budget.